Planning Your Cruise – Tips & Resources! 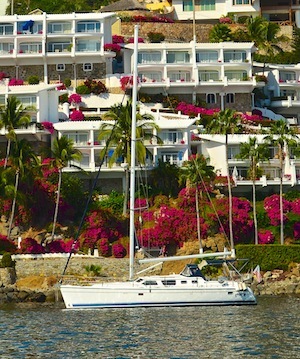 Cruising Mexico on a boat is exhilarating, and we learned all kinds of things during our cruise down south. The following pages cover all the things we discovered during our cruise that we felt might help future cruisers coming behind us. From provisioning to weather prediction to getting laundry done to finding boat parts to figuring out the bus systems, these pages are loaded with gold nuggets of really valuable information. Happy reading, and have a wonderful cruise when your day comes! Learning the Ropes at J-World Sailing School 11/05/14 J-World Sailing School got our cruising dream launched from being a mere fantasy into being a real life adventure. Cruising Mexico Video Series! 10/17/13 Where are Mexico’s prettiest beaches, most romantic anchorages, and best inland trips for cruisers? Our video series shows you! Mexico Cruiser’s Bookshelf – Guides and Resources! 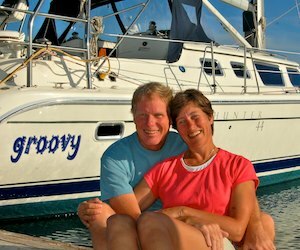 08/18/13 Descriptions of the best cruising guides, reference books, maps, field guides and resources for cruising Mexico. Tips for Cruising Mexico – Part 1 – Navigation, Weather, Gear & more 07/16/13 Page 1 of our boatload of tips and tricks for cruising Mexico, including: adapting to the culture, learning Spanish, navigation, weather & tide resources, boat prep & gear, and more. Tips for Cruising Mexico – Part 2 – Costs, Provisioning & more 07/15/13 Page 2 of our myriad of tips and tricks for the Mexico cruiser, including: cruising costs, checking in, money, provisioning, finding boat parts, internet, laundry, hair care, bugs, and crime. Mexico by Bus – Land Travel in Mexico! 06/04/13 Getting off the boat to see Mexico’s interior really enhanced our cruise. Here are tips for using Mexico’s long distance buses. Spanish Learning Tools – How To Learn To Speak Spanish! 04/30/13 Learning Spanish truly broadens the experience of cruising and living in Mexico. Here are a few tools that have helped us a lot. Mexico Maps 02/05/12 A collection of maps of Mexico’s Pacific coast and Sea of Cortez for cruisers showing all the popular anchorages and destinations. Can you live at anchor on solar power? YES!! Here’s our installation, including our custom arch, and a solar power tutorial.